Every day, respiratory therapists at UPMC have a life-changing impact. 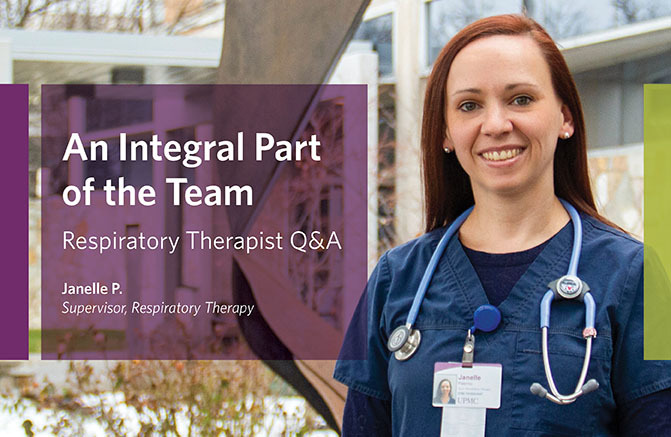 Whether they’re performing diagnostic tests, administering treatments, or educating individuals and their families, respiratory therapists improve our patients’ quality of life, while enjoying a career that is unique and rewarding. Janelle P., a respiratory therapist at UPMC Passavant, agreed to give us an inside look at her career path and shed some light on why respiratory therapy is so important to her. Q: Where did your career begin? A: My career began at UPMC Passavant when I was just 19 years old and attending LaRoche College next door, majoring in communication design and media writing. With the encouragement of a friend, I applied to and accepted a job in food services at Passavant. When I graduated from college, I transferred to admissions/registration, where I worked for three years before hearing about the Health Care Careers Initiative Program (HCIP) from a coworker. I applied and was accepted after the Passavant Foundation contributed to the program, which allowed all interested Passavant employees to participate. Q: What sparked your interest in respiratory therapy? A: I chose respiratory therapy as my field of interest because I was inspired by the Passavant therapists I had met who were so kind, caring, and positive with their patients and coworkers. Being able to work in patient care after working in ancillary departments for nine years was a wonderful opportunity and change. I was inspired by so many amazing health care workers I had worked in conjunction with over the years. Q: How did you become a respiratory therapist? A: The employees of HCIP helped direct and encourage me, and with financial support from UPMC, I obtained my associate degree in respiratory therapy! I first began working in the field full-time as a tech for a few months before I graduated, then upon graduating I completed the board testing to become a certified respiratory therapist (CRT) and then a registered respiratory therapist (RRT). Q: Tell us more about your current role at UPMC! A: I have been in the role of supervisor for about a month after working as a respiratory therapist for 10 years, and it has been both exciting and challenging! I love being able to provide care to patients and being an integral part of the health care team, while also using utilizing my leadership abilities to help keep the rest of the staff and department organized and running smoothly. I love being able to provide care to the patients and being an integral part of the health care team. Q: What is one thing you love and one thing that challenges you in your role? A: My favorite thing about Passavant is my coworkers both in my department and throughout the hospital. Teamwork is crucial in health care, and I love my coworkers because they help support and lift each other up along the way. I think the biggest challenge in the hospital is just dealing with stress, which comes from both patients and coworkers. I focus on the positive experiences and outcomes which, for me, always outweigh the bad! Q: Why do you feel that respiratory therapy is a rewarding career? A: I am passionate about providing high quality care to patients and encouraging and leading others to do the same. Being able to help patients is the most rewarding part of my job. I certainly feel gratification in working as a team to achieve life-changing outcomes, but simply just showing patients that I care about their needs and their overall well being to make their time here less difficult is very rewarding. Every day is different, but I think every day is a chance to help someone’s day be better – that is meaningful and rewarding to me. Inspired by Janelle’s story and interested in joining her team of Life Changers? Click the button below to view current openings in respiratory therapy at UPMC.